Priscilla is a late 20th century apple, developed by the well-regarded "PRI" co-operative or Purdue, Rutgers and Illinois universities. The primary aim of this program is disease-resistance, and flavor can sometimes be a casualty. Priscilla does fairly well on this score though, with a light floral flavor somewhat reminscent of McIntosh and Delicious in a good year, but ultimately this is a late summer apple and cannot compare with the later-ripening varieties. It keeps well for such an early variety, but is at its best when eaten straight from the tree or used for cider. Cropping is consistent and as should be expected it is generally unaffected by disease problems. 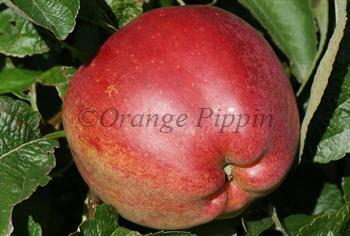 Indeed Priscilla is still one of the most disease resistant apples available. Fill in the details below and we will let you know when Priscilla apple trees are back in stock. Priscilla is a good choice for any grower faced with serious disease pressure. It is a particularly good choice for growers in areas prone to fireblight. The apples hang well on the tree until overripe. Priscilla was one of the very first new apple varieties to be introduced from the co-operative breeding program between the universities of Purdue, Rutgers, and Illinois. During the development it was known as "Co-op 4". Many of the varieties released by this program include the letters "PRI" in their names, and in this case the variety was named after the wife of a president of Purdue university. The initial development took place in the 1960s.